Let’s talk about funding for higher education. We have all seen the headlines. Louisiana’s colleges and universities are facing a potential cut of almost $400 million next year, which could result in the loss of more than half the state funding for our institutions. This loss would come on top of seven years of budget reductions and significant increases in tuition costs to our students. This potential crisis would reverberate well beyond higher education, and the gains that Louisiana has made in economic development could be erased. If we are unable to enroll and graduate the workforce, many of these companies may not stay. The economic stability of Louisiana rides on our collective ability to find both a short-term solution in the budget for next year and a long-term solution to the structural state funding deficit. During the last eight years our universities made significant changes in the way they operate in order to protect the priority we place on serving students with fewer operating dollars. We closed and consolidated hundreds of academic programs, expanded online delivery and joint degree programs, reorganized administrative departments, and implemented cost savings strategies. There are about 2,000 fewer employees on UL System campuses today and more than 300 fewer faculty members than in 2008. Many of our remaining employees have been furloughed, taken on additional duties without additional pay, and watched their colleagues retire or leave the state for better jobs. We cannot lose any more educational capital. 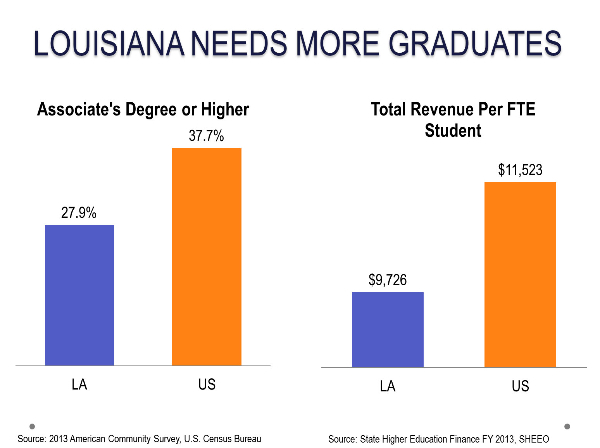 Louisiana has one of the lowest educational attainment rates at a time when demand for college graduates is at its highest. We have an immediate and acute need for college graduates, particularly in high demand fields like engineering, computer science and business. Our work last legislative session to stabilize the base funding, retain tuition revenue, and secure new funding for the Workforce & Innovation for a Stronger Economy (WISE) program provided critical investments that must be protected. The good news is there is widespread understanding of the severity of this problem, and the state’s administrative and legislative leaders are working with us to mitigate the potential cuts. Higher education was spared from the latest mid-year budget cuts, and we believe that higher education will be a high priority this legislative session. It will be important to stay engaged as we focus on finding a funding solution. I will send out updates through this blog as our collective efforts move forward. 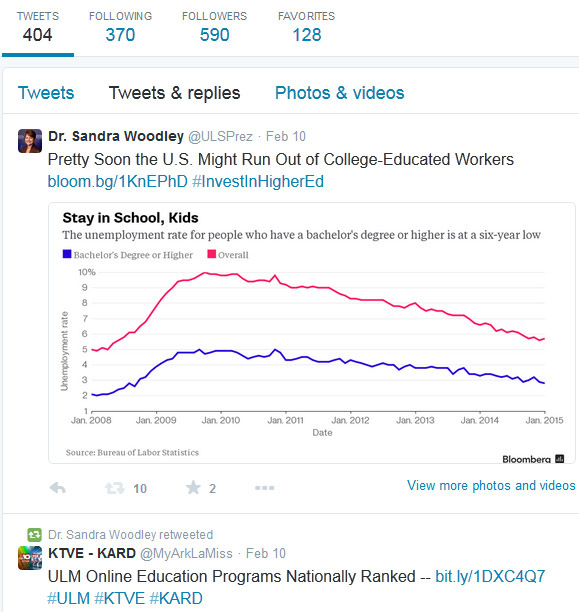 I encourage you to share this information and show your support for funding higher education. If someone forwarded you this message, you can sign up to receive direct updates by clicking here.